The CD version released in 1999 was updated as recently as 2013. New updates are still actively developed by volunteer maintainers, then approved and published by Team17. Based on the Steam version, with minor patches. The GOG.com and Steam versions come with the latest updates previously released for the CD version. New updates are released for the Steam, GOG and CD versions in sync. Sold Out version uses custom Setup.now.exe launcher from publisher and was bundled with Worms 2. Patch v3.0 for the European release (Team17 FTP) synchronizes the game to the later American version and fixes multiple bugs. The latest update is v3.7.2.1 (Team17 FTP; formerly at the official website). 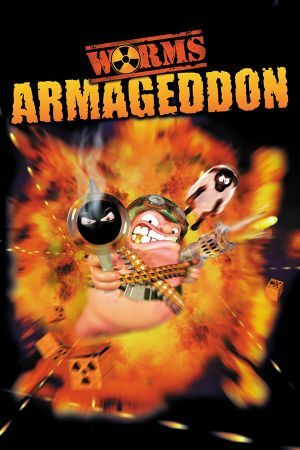 It is a result of Team17's permission given to two community members, Deadcode and CyberShadow, to update and patch the game. Other than fixing a multitude of bugs and adding some new features, the game is now more compatible with newer systems. These patches are not compatible with some versions of the game, however (downloaded versions, such as TryMedia). 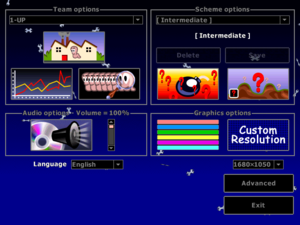 The in-game settings menu is rendered in 640×480 resolution but the game itself is rendered at selected resolution. That however can be fixed with the "SuperFrontendHD" Wormkit module. Interface does not scale with resolution and can be very small in 4K. The game is letterboxed to 1920×854 for cavern levels (on standard-size maps), and 640×480 for the main menu. The main menu problem can be fixed with SuperFrontendHD. See D3D9Wnd. Official support set to come with the 3.8.0 update. Partial support (UI elements). Animations/movements run at 50fps, with full support (interpolation) set to come with the 3.8.0 update. Community-translated (by Mr.X), incorporated in 2008 with the v3.6.29.0 update, followed with updates performed by CyberShadow, Shtirlitz, and StepS. This translation is not the same as the Russobit-M translation (made in 2002). Up to 6 teams, each with up to 8 worms can be present in the game. 6 LAN lobby is available in the Network screen. Up to 6 players plus one spectator can participate in one game. 6 Via WormNET. Up to 6 players plus one spectator can participate in one game. Through a hosting bot (HostingBuddy). Default port is 17011 and can be customized. 7, 9 Selectable from advanced options window. ↑ 3.0 3.1 File/folder structure within this directory reflects the path(s) listed for Windows and/or Steam game data (use Wine regedit to access Windows registry paths). Games with Steam Cloud support may store data in ~/.steam/steam/userdata/<user-id>/217200/ in addition to or instead of this directory. The app ID (217200) may differ in some cases. Treat backslashes as forward slashes. See the glossary page for details.